This recipe appealed for 2 reasons. Firstly Goan’s use beans to make sweets/desserts like Doce de Grao (Gluten-free Coconut Bars), Gorchem ( Moong Dal Pudding with coconut milk), Atoll (Rice and split pea pudding)and secondly I try to eat gluten-free often. I had to try this recipe 3 times till I got it right (according to my oh so humble opinion 🙂 ) and along the way I came up with a cupcakes recipe. 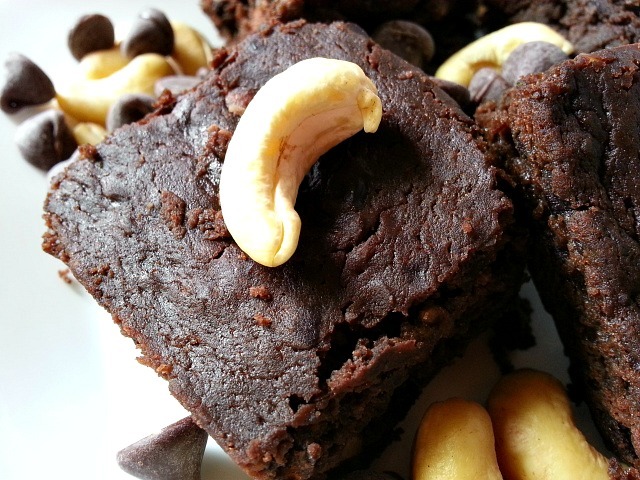 My kids enjoyed these brownie as long as they did not know they were made with black beans but after overhearing my conversation with a friend they just decided it was not to cool to eat black bean brownie no more. My recipe is made with reduced sugar. Here are a few variations you can make. Sugar with 10-15 medjool dates. Make it vegan by replacing the egg with a Flax Seed Egg. Mash or use a food processor to mash the drained beans. In a bowl mix all the remaining ingredients well eggs, vanilla, cocoa powder, oil, salt, chocolate chips, nuts and crushed raspberries. Add the mashed beans to the mixture. Pour in a 9″ brownie pan or in muffin pan. Bake for 25-30 minutes. Check after 25 till the top looks set and toothpick comes out clean. Let cool and enjoy with a nice glass of milk. I love how you give so many options for variations. I am going to try the option with replacing the oil with avocado… Sounds intriguing. Thanks for sharing! I’m a big fan of black bean brownies, and like to use avocados in baking. Can’t wait to try your recipe! It looks amazing. Black beans or no black beans, I’d eat the lot. Thanks Harry. They do have a good ratio of protein. Thanks goes to Nandini of Goa for this fascinating recipe. To cut out the processed cane sugar and oil try it with the avocado and date replacements as she suggests. Delicious! I like your black bean brownie recipe and can’t wait to try it. It will work well on my new low glycemic diet. Protein in a cupcake, yes! Thank you for liking our Swiss Chard with Portobello Mushrooms and Pinenuts recipe this week. Wow…looks amazing and great use of ingredients as well!! Very interesting take on the classic brownie! Absolutly Amazing and Healthy Recipe this is.. Thanks Nandini for Sharing such a sweet recipe..!!! Will share the recipe with my sister who has recently become gluten intolerant! Great post! I simply must try these. Thank You so much Loretta. I too love these brownies as I don’t feel guilty after eating one 🙂 To make cupcakes just add 3 tbsp of corn flour powder. What a healthy and yummy recipe ,Nandini! Thanks for liking our post on health benefits of eggs! Glad you liked it 🙂 Hope you see you back soon! 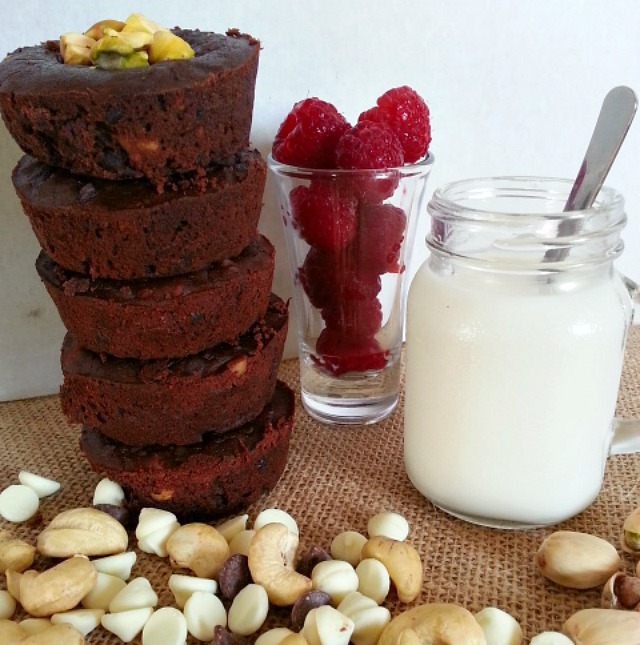 Love your recipe for healthy brownies! 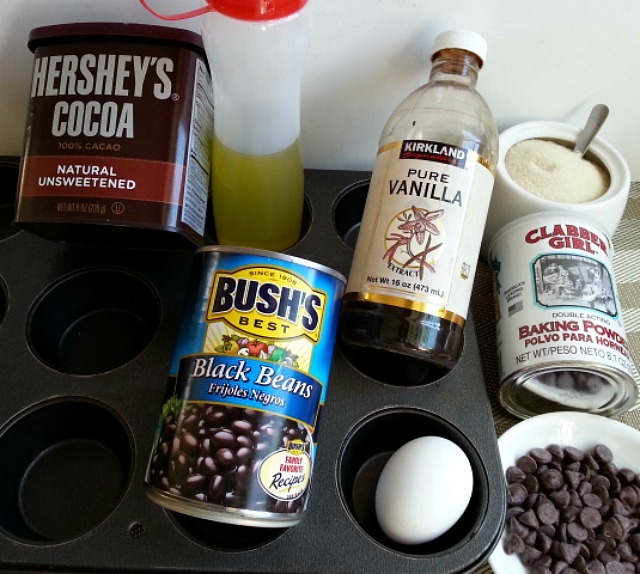 Definitely going to give that a go next time I get a craving :D.
I have been dying to try a black bean brownie! I am going to make these this weekend! These look amazing! Have a fun week! I spent some time in Puerto Rico and sometimes people would serve me a sweet bean dish that I loved. I’ve often thought of combining black beans with chocolate – two of my favorite foods. And cashews . . . three of my favorite foods! These look great. Black beans and chocolate go together surprisingly well! I have a niece who needs to eat gluten-free, so I’m always interested in gluten-free recipes. This one sounds great and I too enjoyed the “Mount Brownie” pic. Also I want to thank you for your like of my “Lobster Tale” post – much appreciated. Awhile back I had asked if it would be ok with you if I featured your caramel bread pudding recipe in my “Mom’s Recipe Box” series. I wanted to wait for autumn. In that autumn has arrived – if it’s still ok with you I will plan to post your recipe soon? Please let me know. Great recipe! Beans are my absolute favorite addition to “healthify” baked goods. Yum! They are gluten-free and look delicious! It’s that man again. MAMMA MIA! 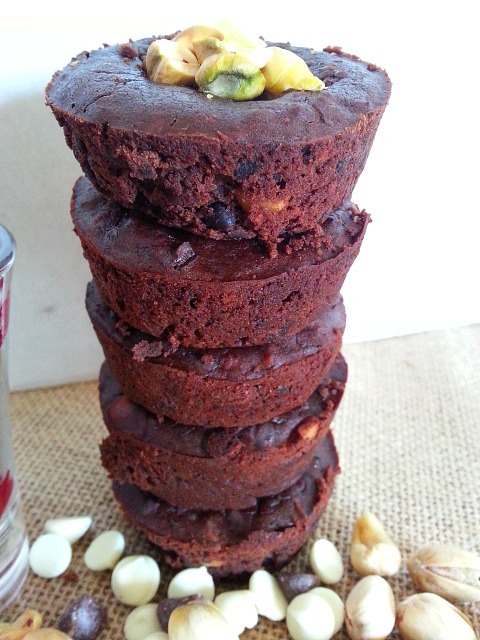 GLUTEN FREE black bean brownies look FANTABULOUS. Your arrangement of the brownies in the photo, looks like a miniature model of a tower, I am FASCINATED. Gluten free brownies is a healthy way of consuming food ,I guess. I also like the idea of AVOCADO as a substitute for oil, and the MEDJOOL DATES for sugar. And if I may say this, besides being a good CHEF, You are also a GOOD DIETITIAN. My spouse LOVES HER CHOCOLATE BROWNIES TO BITS, if You pardon the expression. Last week She baked Her own chocolate brownies at home, they looked FABULOUS. But the only DOWNSIDE was that She forgot to add sugar. WHAT A CATASTROPHE/DISASTER. Fingers crossed the next time She makes some chocolate brownies, I am hoping She will add some sugar. Now She has got a new recipe in the shape of Your gluten free black bean brownies, which will keep Her on Her toes, And finally, I in turn am looking forward to some BRILLIANT brownies, courtesy NANDINI. If you like these, you should check out my black bean cookie recipe on isthisfood. Yay for baking with veg! Just reading the list of ingredients I can tell this is going to be incredible! Thanks for sharing and stopping by my blog earlier. Always a pleasure to see your delicious recipes, Namaste my Dear Lady. Have you tried Hershey’s Special Dark Cocoa yet? what a great recipe! Cant wait to try it out. Perfect for the fall!